A quarter century ago a passion for craft brewing ignited across the country. Today, the founding breweries of 1988 have united to commemorate that seminal year with a special selection of beers. Every bottle is a portal to the renaissance of craft brewing. Each steeped in heritage and expert craftsmanship. Enjoy this tribute to the class of ’88. I had originally tried this beer when it first came out (late spring). I initially thought it was a little too “hot” for my liking, so when I received a second bottle for my birthday I decided to intentionally sit on it for a bit. And it worked! The beer pours for a clear amber color. Mild carbonation, a thin ring of bubbles as a head, but thick stringy lacing. Wut? 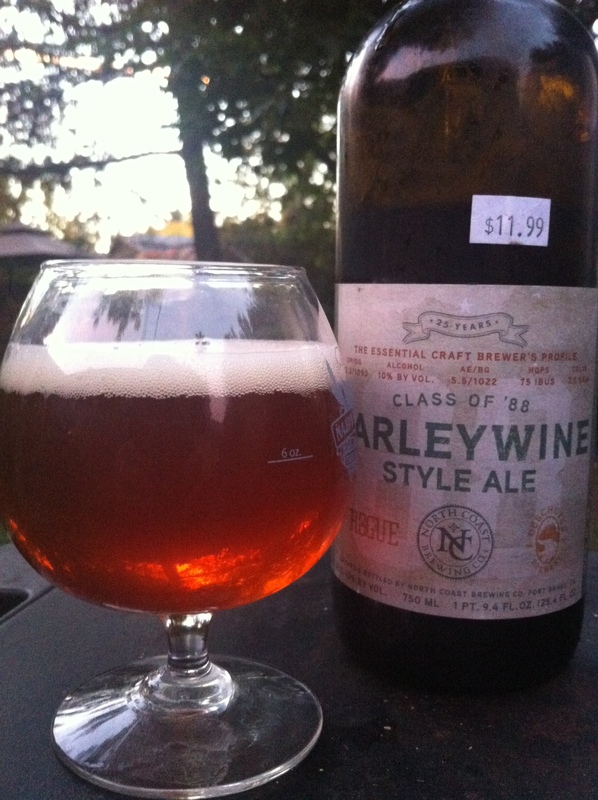 I love the noses on barleywines and this one doesn’t fail to live up to the standard. Molasses, pine sap, hops, tobacco, and leather were all present and accounted for. Very traditional, very good. Hears where it went a little off the rails. The only really dominant flavors were pine and tobacco. That fullness that was in nose turned into a one (two) trick pony in the taste. However, there was also notes of alcohol and rye bread, but those aren’t nearly as tasty as the notes present in the nose. Mouthfeel is surprising light, but as sticky as one would expect from a 10% ABV beer. It goes down smooth, but does leave a few clingers behind as a reminder. As great as the nose was the flavor sadly ended up being rather one-sided. 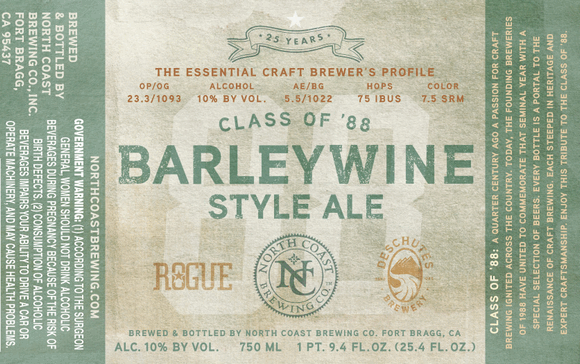 Class of ’88 Barleywine Style Ale is a capable and drinkable barleywine, but not as epic as one would expect a 25th anniversary beer to be.